This morning we awoke to 3 text messages and 2 face book messages about the April show. As I try to find my phone – rifling through the multitude of dogs on the bed I find the phone under my pillow blurry eyed I look at it and think – what great people we have in our lives. Clea and I want to say THANK YOU for starting our day out GREAT. We have received several calls about 3 things. Stalls, Pre Entry and Sponsorship for the Spring show. Second payment by April 1, 2013 Remaining amount will be due at the show. The April show is the break out show to raise money for awards and added money for the Best of the Best Charity Barrel Race – Team Marley Show on September 13-15, 2013 so you ask yourself, then why wouldn’t you take sponsor money – well we don’t want to take the chance of losing money for Team Marley if the April show is not successful. So we are hoping for a nice turn out to help with the BOTB and a great weekend with great people. We will have some various raffles, wine baskets to raffle off, a dollar dance Saturday night – we don’t know yet who you will be paying to dance with, that will be determined – and other little goodies that should help with our goal for the BOTB, so bring an extra buck or two if you have it but come to enjoy the show and don’t forget your dancing shoes/boots. We are taking vendor’s though as we would love to have you get your products and goods out to the public. Country Diva’s are signed up as well as a couple others! Getting excited to see them in April. 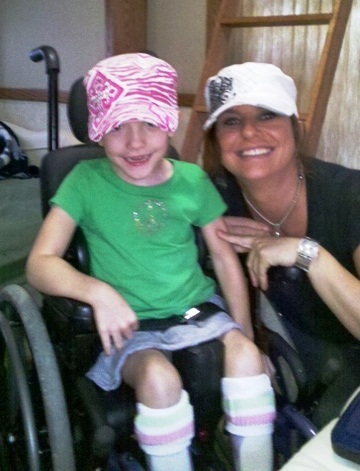 Here is Marley with her Aunt Holly Rocking that Country Diva’s hat she got at the State Show from the Diva’s! Our hope is that this futurity will be a success and we can double the money next year and bring some futurity love to the East Coast! We have some of the best riders and horses East of the Mississippi and would love to see them be able to run without the cost of traveling west. We believe some of the best young horses are missed on the East Coast because of the cost of travel. Here’s to hoping to a nice turn out for the futurity. Clea and I really just want everyone to have a great time and start off the 2013 Barrel Racing Season with great friends and great people and in the process help with the BOTB show. Until we meet again – Be kind to everyone and love one another a little more than you did before. Previous How did Team Marley start you ask? Next BOTB 2013 – September 13-15 Awards, Big Added Money, State Battle and More…..